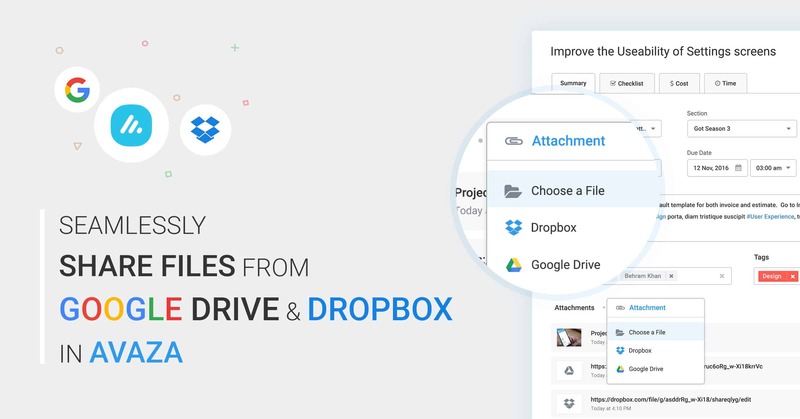 We’re happy to launch our new Google Drive & Dropbox Integrations, which allow you to attach files you already have in your cloud drives to Avaza Tasks, Task Comments, Quotes and Invoices. This means you can now keep all you documents in one place, and link to them easily when required via the Add Attachment button on Tasks, Task Comments, Quotes and Invoices. It is easy to link any photos, videos, Photoshop, Excel or other files stored in Dropbox or Google Drive to Avaza. No need to download large files from one system and then upload them to another system! Browse your entire document management library with a couple of clicks. You can also take advantage of other Google Drive and Dropbox features, such as annotations on documents, permission-based access and free storage space. Click Add Attachment on Task, Task Comments, Quotes or Invoices. Choose the document you wish to upload. A small Dropbox or Google Drive icon displays which app the file has been uploaded from. Uploaded files are linked to the live version of the file on Dropbox / Google Drive and are available for viewing based on your Dropbox or Google Drive permission settings. Your team members can click on the View button to view a preview of the file if available or download it if required. They can make changes to the document online, or leave comments on the file. Files stored on Google Drive or Dropbox and attached in Avaza do not use your Avaza storage quota. NIce addition. Could you also implement this functionality to add files to projects directly instead via tasks ? I’ve recorded your request for this 🙂 Thanks for the suggestion! Please add OneDrive support. Office 365 integration in general (SSO, onedrive, Flow, etc.) would be huge. Thanks for the feedback! We’ll add your vote for OneDrive/Flow/office365 support etc. By the way, in addition to OneDrive/Flow, are there any specific Office 365 integration points you’d find useful? Start doing better business with Avaza. Signup for free. No credit card required. Schedule the Automatic Delivery of Reports! Running Timers now appear in your Browser tabs! Introducing one-click Task Status update!